The Cleveland Cavaliers lost yet another close game as the Minnesota Timberwolves traveled to Cleveland to take on the Cavaliers at Quicken Loans Arena on Monday. Shooting guard Kyle Korver (22 points), swingman Rodney Hood (20 points) and center Tristan Thompson (16 points, 11 rebounds) led the charge for the Cavaliers but points were hard to come by as Cleveland only mustered 95 points in the loss. Most problematic for Cleveland was their turnovers by their starting lineup, as 15 of the team’s 17 total turnovers (which led to 17 points for Minnesota) and an uncharacteristically anemic scoring night for guard Jordan Clarkson, who scored just four points in 22 minutes (shooting 1-5 from the field and 0-4 from three-point range). Second-year forward Cedi Osman (eight points on 3-12 shooting from the field) had his second straight rough shooting night after scoring seven points on 1-6 shooting against the Houston Rockets as rookie point Collin Sexton (11 points on 5-19 shooting from the field) saw more shots clank off the rim than he has of late, especially after scoring a career-high 29 points against the Rockets. It wasn’t a dominance performance by the Timberwolves by any means but individually, both Karl Anthony-Towns (21 points, 10 rebounds) and Robert Covington (24 points, 7 rebounds, 2 steals and 2 blocks) were dominant while Minnesota’s tandem of point guards, Jeff Teague and Derrick Rose, tallied a combined 25 points and 10 assists on 11-25 shooting from the field. Against the Houston Rockets on Saturday, defensive standout David Nwaba managed to hold the league’s reigning MVP, James Harden, to 3-15 shooting from the field while the perennial All-Star went 11-15 from the field against his other matchups. Considering what we already know about Harden’s all-time great offensive abilities, a player who just scored 54 points against the Washington Wizards on Monday night, Nwaba’s defensive work should be praised. It’s not the first time that Nwaba has guarded the opposing team’s best player, as Nwaba also guarded Los Angeles Lakers superstar LeBron James when the Akron-born star returned to the franchise he spent 11 seasons with. Nwaba made it difficult for James then too. On Monday, with Teague and Rose scoring off-the-dribble with ease, bouncing past Sexton and company with little resistance at the point of attack, Nwaba’s defensive presence couldn’t have been missed any more. 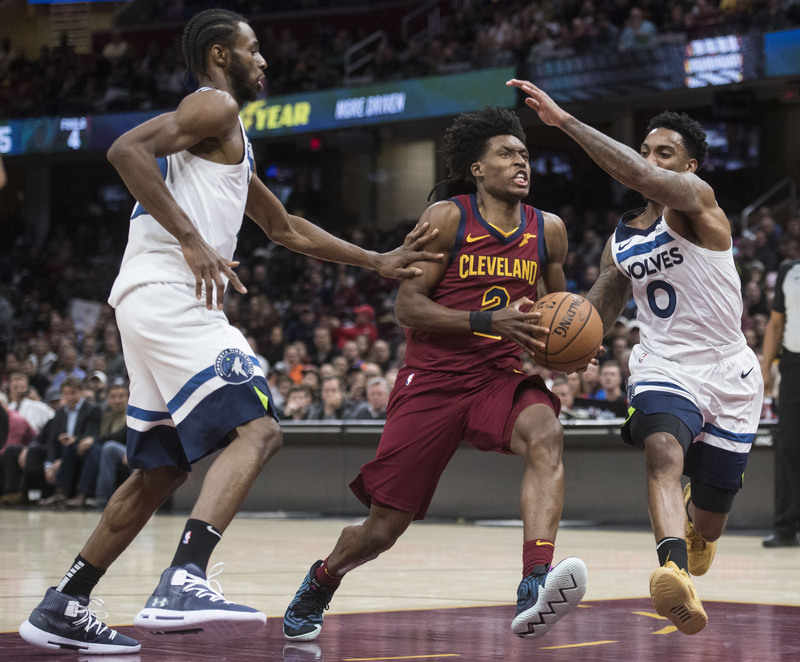 If the Cavaliers had managed to slow Minnesota’s point guards down even a little, then they likely would have came away with a victory on Monday. Opponents have started to circle Sexton’s names on scouting reports and it’s no wonder, considering how the rookie has fared since being moved into the starting lineup in place of the injured George Hill. Sexton has averaged 18.7 points, 3.8 rebounds and 2.8 assists per game as a starter (nine games) while shooting 47.7 percent from the field and 47.6 percent from three-point range, making opponents pay for leaving him open for jumpers when they give him space to shoot and showing an increasing understanding of how to use his speed and body to score around the rim. However, against the Timberwolves, Sexton had a rough shooting night (5-19 shooting from the field) and four turnovers as Minnesota ramped up the defensive pressure and gave him much less room to shoot than he’s been given in previous games. It didn’t go unnoticed by Cleveland and following Monday’s game, Cavaliers center Larry Nance Jr. told reporters what he told Sexton following their seven-point loss. Cleveland Cavaliers point guard George Hill has missed the Cavaliers’ last nine games and when he returns to the lineup, he’ll likely have lost his starting role considering how Sexton has played in his absence. It’s not as if Sexton eventually taking the reins of the starting point guard wasn’t expected to happen eventually, so Hill isn’t going to be caught off-guard by the move when he rehabilitates his injured right shoulder. However, when Hill returns, his absence will breathe new life into Cleveland’s second unit. The Cavaliers’ bench has Clarkson, a sensational scorer averaging 15.5 points per game; Korver, an all-time great three-point shooter knocking down 46.3 percent of his three-point attempts and Larry Nance Jr., an uber-athlete and stat-sheet stuffer. Nonetheless, they don’t have a point guard in the second unit that can both facilitate and threaten the defense as a scorer. In place of Hill, two-way signee Andrew Harrison is the team’s backup point guard and though the 6-foot-6 Harrison has shown himself capable of being a decent defender and a careful passer, he does neither at the level of Hill and the gap between Harrison’s scoring ability and Hill’s is as vast as Lake Erie. Harrison has averaged 4.5 points per game on 32.3 percent shooting from the field and 25.0 percent shooting from three, whereas Hill has averaged 12.6 points per game on 55.6 percent shooting from the field and 48.0 percent shooting from three. When the Cavaliers’ starters sit, it seems to spell doom for the team’s scoring capabilities. However, by replacing Harrison with Hill in the second unit, there’s no denying that Cleveland would have a far better chance of building, maintaining or mounting a lead with their starters out.